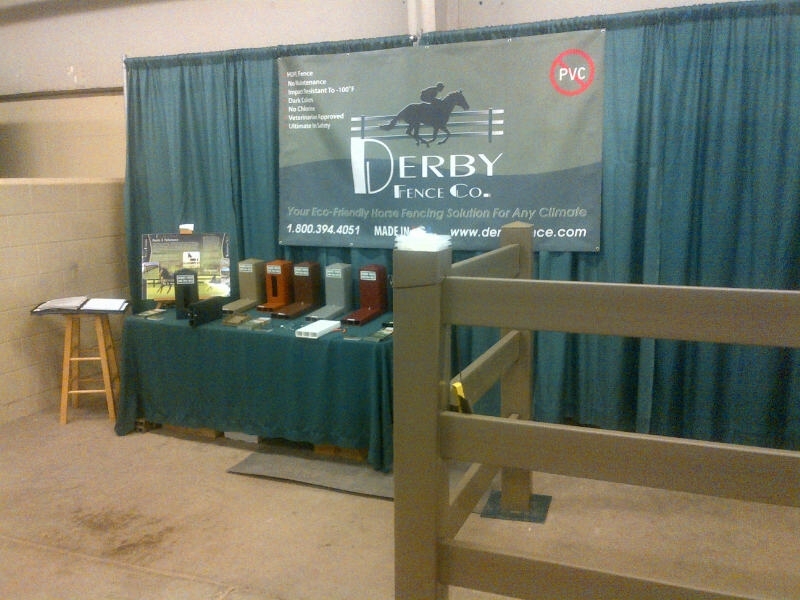 Finally back in the office from exhibiting HDPE Derby Fence at EquiFest 2015, which was held February 13,14 and 15 at the Kansas pavilions in Park City (Wichita) Kansas. This is always a well attended Horse Fest that draws equine enthusiasts from CO, OK, MO and KS. EquiFest brought in two of my favorite clinicians, Julie Goodnight and Chris Cox whom never disappoint in drawing in the crowds and if you didn’t learn a thing or two you must have been staring at the cowboys or cowgirls. This is the last year EquiFest will be held in the Wichita area, the facility was sold to an aviation testing company and 2016 EquiFest will be held at the State fair grounds in Hutchinson, Ks about 50 miles northwest of Wichita. If you have ever seen Derby’s HDPE Equine Ranch Fence at a horse fest, you know that if you hear loud banging noises it’s the guy in the Derby Fence booth beating the day lights out of one of our rails to prove that all plastics are not a like. It’s a very effective method to stop folks in their tracks or to get them to turn around after walking past the booth thinking that Derby Fence is just a PVC-Vinyl fence. Spoke to many folks from OK about their Cattle Fencing needs, a couple from Topeka that wanted to replace their rotten wood Ranch Fencing with our durable HDPE Derby Fencing. Interests were from 300 feet of four rail for a dry lot to four thousand feet plus of three rail to be used as an Equine perimeter Fence.